There's inherent risk in signing any pitcher long-term, let alone someone who has just one full season of Major League experience to his name. If you're wondering why teams ever commit $10MM-plus to relatively inexperienced pitchers, take a look at the Rockies and Ubaldo Jimenez. When Jimenez signed his current extension with the Rockies, he had similar numbers to the ones Wade Davis has now. Their ERAs (Davis 4.01 vs. Jimenez 4.06), records (Davis 14-12 vs. Jimenez 16-16) and innings totals (Davis 204 1/3 vs. Jimenez 288 1/3) were comparable after one-plus MLB seasons and those stats led to similar extensions (Davis four years, $12.6MM vs. Jimenez four years, $10MM). Two years into Jimenez's deal, he has developed from a promising 25-year-old like Davis into a Cy Young candidate and legitimate top-of-the-rotation starter. Jimenez has posted a 3.17 ERA with 8.4 K/9 and 3.6 BB/9 since signing his extension, averaging 220 innings and 17 wins per season. If any doubt remained about his status as an ace, he erased it last year, throwing a no-hitter, making the All-Star team and finishing third in NL Cy Young balloting. Jimenez earned twice as much as pitchers in his service class in 2009-10 thanks to the structure of his extension and he'll earn $2.8MM in 2011, his first season as an arbitration eligible player. It's a substantial raise from his 2010 salary of $1.25MM and not a bad salary for a first-time arbitration eligible pitcher. But given Jimenez's career accomplishments to date, he could have surpassed the salaries Mike Pelfrey ($3.925MM) and Chad Billingsley ($3.85MM) earned their first time through arbitration and matched Jered Weaver's $4.265MM salary. Not only is that $1.4MM more than Jimenez will actually earn in 2011, a $4.265MM salary would have set him up for future arbitration raises. As it stands, Jimenez will earn $4.8MM from 2009-11, about the same as he would have obtained by going year to year. 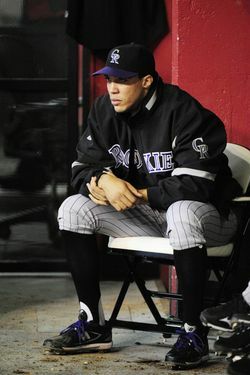 The Rockies will start saving big in 2012, when they'll pay Jimenez just $4.2MM and the savings could continue in 2013 and 2014, as the Rockies have a pair of team options. The risk paid off for Colorado, which could save $15MM or more if Jimenez stays healthy and GM Dan O'Dowd exercises both options. That doesn't make the deal a regrettable one for Jimenez and his representatives at SFX, however. Like Davis, Jimenez took the risk that his performance would justify larger raises than the ones structured into his extension in exchange for the security of guaranteed money. Like Davis, he'll hit free agency in his early 30s, even if the team exercises its options, so there's still time for a substantial free agent payday. what happened to his velocity today?